MARION, Ind. – Before the IHSAA Class 4A Marion Regional, Kokomo coach Brian McCauley said Homestead’s 6-8 sophomore Caleb Swanigan looked like he was ready to play in the National Football League. After the regional opener, the Kats might have felt like they played an NFL game. In an extremely physical contest, the Spartans topped Kokomo 68-60 in a bout that featured one blood stoppage, 46 total fouls and four Wildkats exit the game with five fouls. The Kats also shot a cold 37 percent from the field, hit just 2 of 20 attempts from beyond the arc and 12 of 20 from the charity stripe. After a quick 6-0 run to open the game for Homestead, Kokomo battled back – and four lead changes later the Spartans held a 16-15 lead after one quarter. The second quarter was much like the first – four more lead changes and two ties – and Homestead took a 30-27 lead into the halftime break. Unfortunately for Kokomo, while playing a competitive second half, they could never regain the lead or control the tempo of the game while Swanigan controlled the paint. 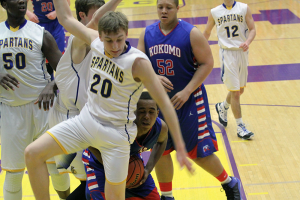 Add that Kokomo was called for nearly twice as many fouls as Homestead (30-16), and a win just was not in the cards. Kokomo trailed 43-37 after three quarters, but the fourth quarter saw its best players foul out – Erik Bowen left with 3:28 remaining, followed by Tayler Persons, Mykal Cox and Jordan Matthews. But yet, Kokomo found itself still in the game, tailing 59-55 with 63 seconds left. In the end, it came down to the basic concept of free throw shooting, and Homestead hit 9 of 10 in the final minute while Kokomo missed 7 of 11 in the fourth period. Persons, an Indiana All-Star candidate and Northern Kentucky recruit, ended his brilliant Kokomo career No. 8 on the Kats all-time scoring list with 1,131 points following a 14 point performance against Homestead. Bowen dropped in 17 points and Jeron Gray added 11. Cox had six points and five assists while Brad Dockemeyer joined Demarius Warren with a team-high six rebounds. Gray started for Dockemeyer, who like Cox, was battling flu-like symptoms. Swanigan had a game-high 18 points and 22 rebounds to lead Homestead. The 250-pound big man helped lead Homestead to its first regional title later in the day with a 59-57 win over No. 3 Hamilton Southeastern. For the day, Swanigan – who has college offeres from Indiana, Michigan State, Illinois, Pitt, Georgetown and Tennessee – finished the two games with 44 points (17 of 30 field goals), 35 rebounds and seven assists. An interesting note on Swanigan: Citing his love for basketball and the risk of injury, he left the offensive line and the game of football after his freshman season despite receiving inquiries from SEC powers Alabama, Auburn and LSU. Wildkat Nation said goodbye to one of the most successful classes in Kokomo history. Persons, Bowen, Cox, Dockemeyer, Warren, Brandon Wilson, Jazimar Woodard and foreign exchange student Jordan Eley will graduate as the first class to reach four consecutive Class 4A Sweet Sixteen’s in school history (class basketball started in 1998). The Class of 2014 played in a program that finished with a record of 81-19 in four seasons (21-6 in the North Central Conference), winning four sectional titles, two NCC championships (2011 and 2013) and playing in a memorable 2011 IHSAA Class 4A state title contest. “This group is winners – they have done so much at KHS,” concluded McCauley.